It was a sunny and brisk 46 degrees for our early morning departure out of Sandpoint. 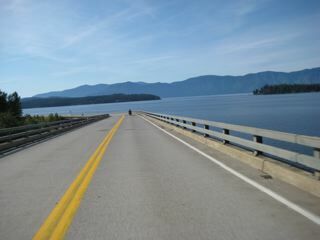 We planned to head out the Pend Oreille scenic byway which spends its entire length next to water, whether the massive Lake Pend Oreille or one of the rivers that feed it. 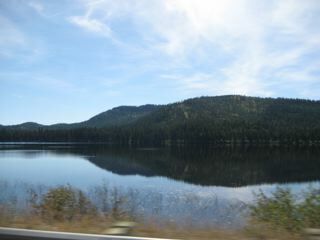 This lake in the northern Idaho Panhandle, is 65 miles long, and 1,150 feet deep in some places, making it the fifth deepest in the U.S. Only locals know that the lake is still used by the Navy’s Acoustic Research Detachment to test large-scale submarine prototypes. View the Navy dock HERE. We grabbed a drive-thru breakfast in Ponderay, a small community north of Sandpoint then headed eastward. Highway 200 passes through the towns of Kootenai, Hope, and Clark Fork prior to hitting the westernmost portion of “Highway 200” which extends east through Montana, North Dakota, and Minnesota. About 30 minutes into the ride if you blink you’ll pass by the Cabinet Gorge Dam. It’s located about 10 minutes prior to hitting the Montana border. Located on a cliff directly over the dam there is a road which looks like a forest road to the right, but it’s just worn out pavement. My grandfather worked at this Dam which was built in the early ‘50s. It took only 21 months to complete with 1700 men working 24 hours a day. Avista Utilities operates the dam which is one of several on the Clark Fork River which has caused issues with Bull Trout migrating to Lake Pend Oreille for years. 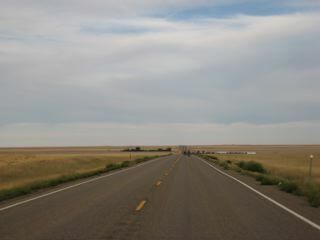 We connected with Montana’s Highway 56 which runs in a northerly direction from an intersection between Noxon and Heron, about 10 miles east of the Idaho state line. The highway runs approximately 35 miles and meets up with U.S. Route 2 about 3 miles east of the town of Troy, MT. This highway passes through a forested and mountainous landscape. 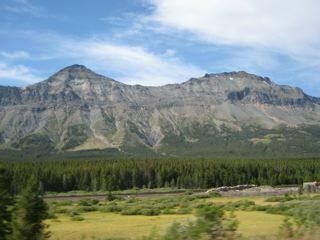 It travels along the eastern shore of Bull Lake; the Cabinet Mountains are to the east. 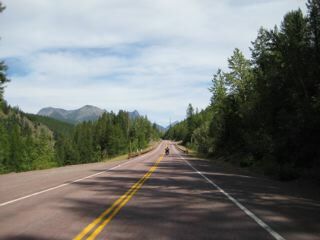 The entire route is within the boundary of the Kootenai National Forest. Highway 56 is known locally as the “Bull Lake Road” and you’ll often find “deer smear” laying on the side of the road. We fueled up in Troy and headed east for the 100+ miles to Kalispell and West Glacier Park. Glacier National Park is known as the “Switzerland of North America” and is enhanced by the historic Swiss style lodges and chalets located throughout the Park. There are over a thousand miles of hiking trails. When Glacier National Park opened in 1910 it was a time when preserves were opening all over the West as railroads made mountain travel easier. The Great Northern Railroad had just built Belton Chalet, where well-to-do tourists could unload their trunks and servants to experience the wonders of the West in comfort. This is just one of many hundreds of such stories that you can find about this rich in history area. We rolled through the park and made tracks to East Glacier. When we arrived in Cut Bank it was 95+ degrees. By the time we passed the Camp Disappointment sign on the Blackfeet Reservation (near Browning, MT) we were ready for a swimming pool, but we needed to make some more miles. Camp Disappointment is the northernmost campsite of the Lewis and Clark Expedition. It was somewhere near this area out on the plain that Santiago encountered a “suicide bird” attack on the chrome Harley wheel. Sort of a “Wild Hog” moment, but not quite as funny. We extricated the remaining bird feathers from the fender and proceeded across the plain to overnight in Havre, MT. We accomplished ~450 miles thru bugs, heat and Montana wind. We truly looked forward to dinner and some cool refreshments.